When gifted with a lot of figs, as we were a couple of weeks ago, imagination is required in order to create a savory meal. 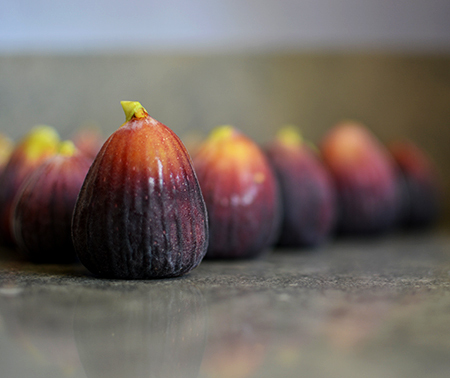 Desserts are easy, as figs are so naturally sweet. 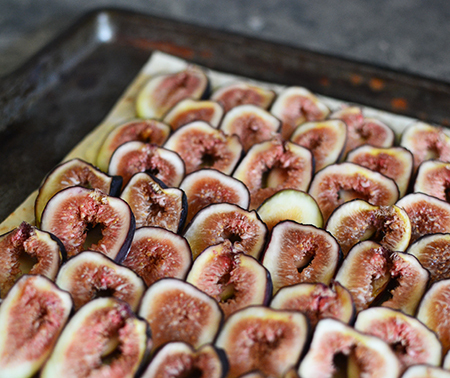 Tarts, cakes and preserves all use a lot of figs. 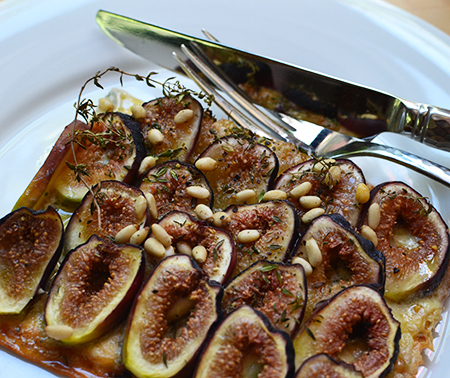 But, among savory dishes, a few figs go a long way. 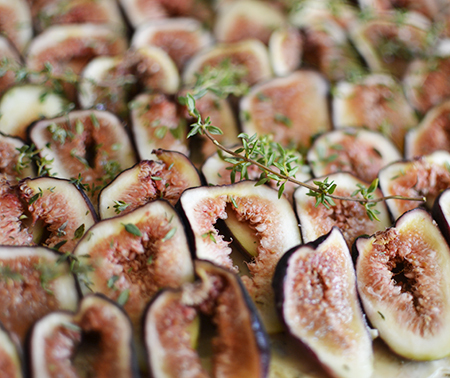 There aren't many recipes of this sort that call for a pound of figs… or more! It made me think about what pairs well with figs. Cheese came to mind first. Nuts, too. And thyme. Wait. Maybe rosemary? No, thyme is right. I remembered that Trader Joe has wonderful Armenian-style lavash flatbreads. Mark and I used to top them with just about anything to make a quick weeknight meal. However, by topping them with "just about anything," we learned that some ingredients make them soggy. And cheese and figs might just do that. To keep this from happening, I harkened back to something I learned through pie and tart making: brush the crust with egg white and bake it just enough to dry the whites and create a moisture barrier. 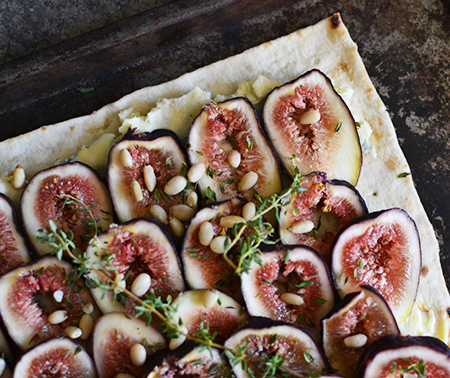 For the fig flatbread, I chose Cambozola - a sweet, creamy blue cheese that spreads well, and goes beautifully with figs, pine nuts, and thyme. We both loved the results. 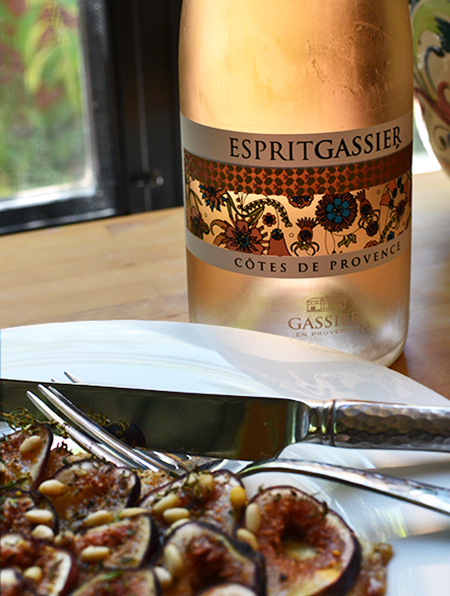 I paired it with Esprit Gassier, a Provençal rosé by Château Gassier (I can't let go of summer, or its wines!). The bottle itself is just beautiful, and the flavor? Well, you can read about it on the Provence WineZine this week. I will miss fig season. But it isn’t autumn yet! Place the lavash on a baking sheet and brush with a little egg white. Place in the oven for 1 minute to seal the bread. Let cool. Once cool, mix the remaining egg white with the softened cheese and spread evenly over the entire lavash. Sprinkle with half the thyme leaves (or all the dried thyme, if using). 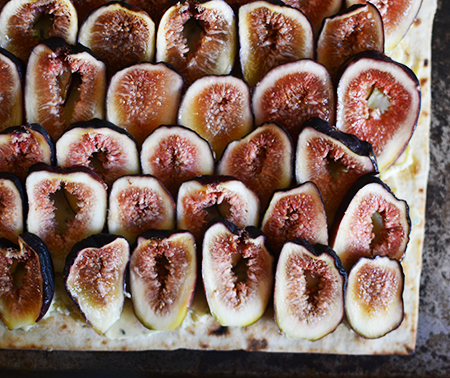 Layer the figs on top of the cheese, as if they were roofing shingles. Sprinkle with the pine nuts and remaining fresh thyme leaves. Lightly salt and generously pepper the top of the flatbread. 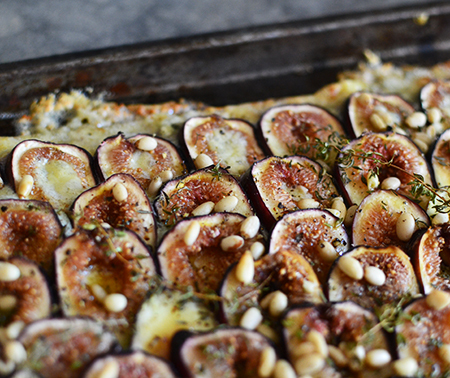 Drizzle with olive oil, and bake for 11-12 minutes until edges are crisp and brown and figs are soft. Cut into quarters and serve immediately. Serves 2 as a light meal with a salad, or 4 as a first course. Heading out to find figs!!! Hope you found some, Jill! Trader Joe was well stocked this week. Once I get home I'm going to be looking for figs to make this . My father in law used to have a fig tree . It was heaven for me. Fresh figs off the tree are a slice of heaven, Gerlinde! Your fig season is coming soon, Paola! And your trip to Italy! Buon Viaggio! Wow, this is beautiful food and looks super delicious!! 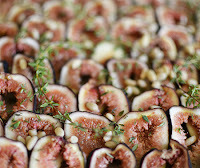 Adding figs to my grocery list for tomorrow, I just have to try this! I hope you enjoy it, Marcelle! Blue cheese and figs. Two of my absolute favourite things. This one's a stunner, David. I could nibble on this all day! I'd say the same, John, but I know it would be gone in about 20 minutes! Who are all these people who keep gifting you copious amounts of produce and where can I find them?? I wish someone would leave pounds of figs on my doorstep! I've been eating loads of them recently but it's hard to keep them around long enough to do anything other than eat them straight up! This does look amazing though! It's worth holding back a few to try this, Caroline! Looks yummy! 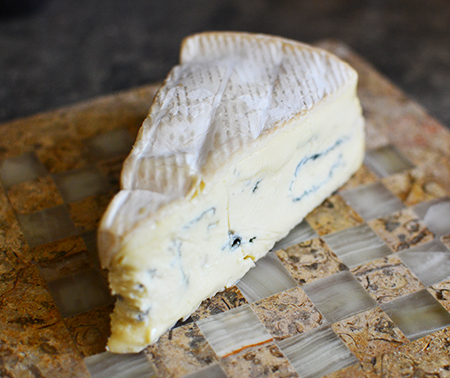 Love the combination of fig and blue cheese, a classic. Looks pretty easy, too. So, so easy, Frank. Perfect for a holiday weekend when all you want to do is sit and enjoy the view! So beautiful!! If only this was posted earlier in the week - I was gifted a bag of fresh figs; which I devoured in a few days - so easy to do. Will have to remember this one! Sorry about my timing, Cathy! maybe you will get some more figs! Oh boy, this looks fabulous! I like Cambozola but never think to get that instead of regular blue. This is such an elegant tart and so easy to put together. Love your flavours. So lucky to have such generous friends!! Thanks, Nazneen! 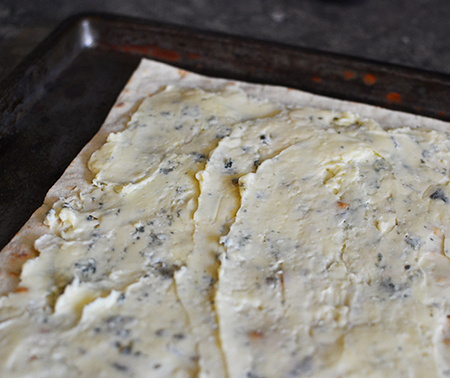 I love Cambazola and get it often because it is easier to access than Gorgonzola dolce. Yes, we are lucky to have generous friends! No one complained too loudly, Greg! It is a good trick. Oh, man does this ever sound good, David. I've been in homegrown eggplant hell here and haven't bought a single fig yet this season. I need to remedy that. Your dish would be a great place to start. I need to get back to my Italian market! Thanks for sharing another great recipe, David. Homegrown eggplant hell sounds pretty good, John! Are you making wonderful things? If you make this, I hope you enjoy it as much as we did! Thanks, Summer! Just visited Summer Daisy Cottage - lovely photos! I was going to accuse you of taunting us with figs again... But then I started looking at the dish and got all doe-eyed and wistful. Yes, another beauty! So sorry, Inger! :) I will neither tease nor taunt you any longer this season... Come next summer, all bets are off! You're going to hate me, but I don't like figs. I know, this is the reason my mother says I'm not her daughter (her favorite fruit!) However, this does look lovely and if I'd like figs, I'd TOTALLY demolish this! Christina - I could never hate you! But I am surprised that a foodie such as yourself has their picky issues! (This may be your third admission of such dislikes! :) Maybe I am just lucky (or unlucky if thinking waistline) that I love everything! Oh yeah, I wouldn't be surprised if it's my third strike! I believe I am a "super taster". I read about it once and the article listed some foods that super tasters tend not to like and I was checking them off! Keep wanting to test myself, but never have! Haha! The concept of a "super taster" not liking foods seems counterintuitive to me, although I know that isn't the point! I bought that exact lavash TODAY at Trader Joe's. Clearly I'll have to make this. It's absolutely beautiful! And thanks for the moisture barrier tip. I have never tried that. Aren't they the best, Valentina? The moisture barrier really helps keep them from getting too soggy. 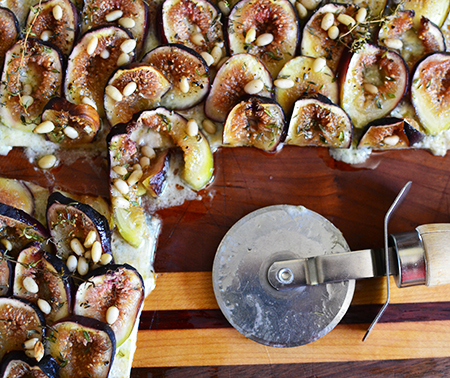 What a brilliant thing to make for making the most of figs when they're in season. Thanks, Caroline - I am going to miss fig season! I don't know how it happened, but I haven't had any figs in ages. A friend with a tree used to give them to me when they came on, so I guess I was just waiting for that and it never happened! Gorgeous way to use them. 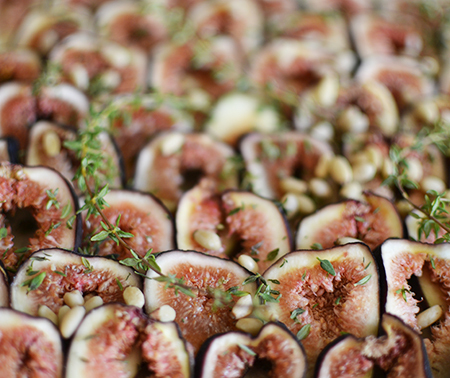 Maybe you need to invite your friend over for the fig tart, then ask her/him to bring the figs! Thanks for your kind comments, Jean! I am finally getting 'round to commenting on this luscious and, to me, unusual dish. I am intrigued! I love figs, blue cheese, and honey...so I must try this. Gold Harvest has figs as I write! I've, of course, read,with great interest, about the rose you paired it with and THAT sounds like a great combo! Hmmm... I love that you mention honey, even though I didn't use any! Must be a subliminal response - and now I want to try it! A drizzle overtop would be lovely!